Urethane Tubes – Tight Tolerance Industrial Tubes! Urethane Tubes ? You’ve come to the right source! Custom Urethane Tubing: Custom urethane tubing for machining stock is available in any hardness for the most demanding applications. Using high-quality polyurethane prepolymers from world leading chemical suppliers Plan Tech is able to produce high-performance custom urethane tubing for any application. 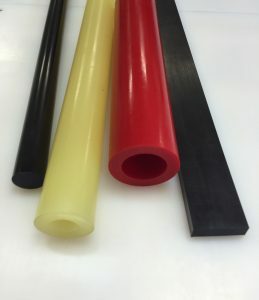 Urethane Tube Stock: Urethane tube stock from cast high-quality machinable polyurethane material suited to fit any applications is available at Plan Tech. We supply urethane tube stock up to 48 inches tall and available in most common nominal OD & ID sizes with a tolerance of +/-.030. Each urethane tube is hand cast allowing us to tailor our urethane material to add lubricity or an anti-static urethane for rolling applications. Polyurethane Tubing: Polyurethane tubing is offered in a variety of size combinations. Plan Tech for the last 30 years has been adding onto what we call our family mold size. Currently, we can cast any OD ID configuration up to 4.5’’ with no tooling set up charge with a tight tolerance of +/-.010 in one-foot sections. We also have 3 and 4-foot molds of limited sized. Special sizes are no problem for our in-house mold fabrication machine shop. Plan Tech’s tubes are outstandingly able to withstand more loads than rubber because they are harder than rubber and yet more flexible than plastics. Their flexibility is accountable for their strength and remarkable ability to resist impact. Polyurethanes are the perfect choice for applications against severe wear regardless of low temperature. For some decades now, they have been the most used materials for environments that are highly abrasive owing to their super ability to resist abrasion. No other form of elastomers, metals, and plastics has a better abrasion resistance than polyurethanes. Their abrasion resistance ability is rated to be 10 times better than what other materials can provide. Like their abrasion resistance ability, the properties of polyurethane materials are highly capable of resisting oil and chemicals. This enables them to maintain stability (with minimal swelling) in water or oil etc. If you are looking for elastomer materials to use in subsea, then polyurethanes should be your ideal choice. Urethane tubes are cast products and are not an extruded thermal plastic. We manufacture cast urethane tubes to custom sizing specifications. We can also have the manufacturing ability to cast large polyurethane tubes. The urethane tubes that we cast a wide hardness range, with formulations from 20 Shore A to 75 Shore D. We also manufacture in custom or standard diameters, lengths and wall thicknesses. If your application requires tight tolerances we have a full machine shop able grind the OD of the urethane tubes to tight tolerances. Our engineering department can turn your idea, sketch, drawing or CAD file into custom urethane tubes. We will reverse engineer to recreate any urethane part for production or one-off urethane pieces. The engineering department uses state of the art engineering software such as SolidWorks and our machine shop uses CamWorks for 3 axis milling. Our equipment includes CNC mills, lathes, polyurethane grinders as well as a state of the art urethane waterjet cutting machine. Secondary equipment includes sheet metal, welding, grinding, automated cutoff, broaching and more. We offer complete manufacturing capabilities for the inserts or cores required for your parts and provide one-stop shopping for all of your custom cast urethane tubes requirements. For over 30 years we have focused on using speed and precision to manufacture the highest quality industrial cast urethane tubes to our customers. A particular strength is the breadth of our in-house capabilities such as grinding urethane tubes and custom polyurethane parts which, when combined with our extensive experience, enables us to deliver tight tolerance custom urethane tubes while maintaining the quality control and cost effectiveness our customers require. The tests are performed according to an established set of standards provided by an accredited testing organization such as the Society for Testing and Materials (ASTM) who define the procedures in detail. In addition to these state of the art technical capabilities, Plan Tech also has an outstanding team of dedicated employees with exceptional talents designing and manufacturing tight tolerance urethane tubes. We also are very proud of the “company we keep.” Our customers include many Fortune 500 companies, most of whom have been customers for 20+ years. Their drive to become industry leaders has helped us do the same. Please Contact us for further details regarding your custom urethane tubes applications!